Have sales questions or need customer support? Launched in spring 2009, Rally Congress is a platform for organizations to spark online action and reach lawmakers on Capitol Hill and in all 50 state legislatures. Our mission is to offer the most innovative and powerful online advocacy tools at an affordable price. We handle the technical deployment, allowing our clients to focus on their message. We are non-partisan with over 400 clients, and our servers and staff operations are based in the DC-metro area. With fair and flexible pricing, we are giving organizations and movements all across America a more effective voice. If you are not a customer yet, thank you for considering Rally Congress. Please contact us if you have any questions, or get started now. 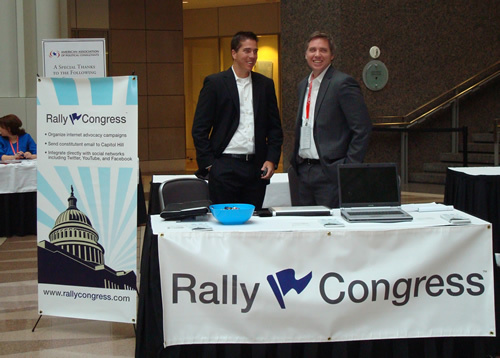 The Rally Congress sponsor table at the Politics Online Conference.